Hello Stampers! Welcome to another fun challenge over at Tuesday Throwdown! This week the challenge is "Circles" and Robyn's Fetish is sponsoring. I am using this Bookworm image provided by Robyn's Fetish for my card. I embossed the yellow cardstock with a circle embossing folder from Provo Craft and I punched some holes in the green cardstock using a small hole punch. The circles are adhered to the card using 3-D foam tape. Last is the sentiment and gingham ribbon. Please visit Tuesday Throwdown to join in this fun challenge so you could win some awesome stamps from our sponsor. I love your colors and the punched circles- such a great accent to the image! 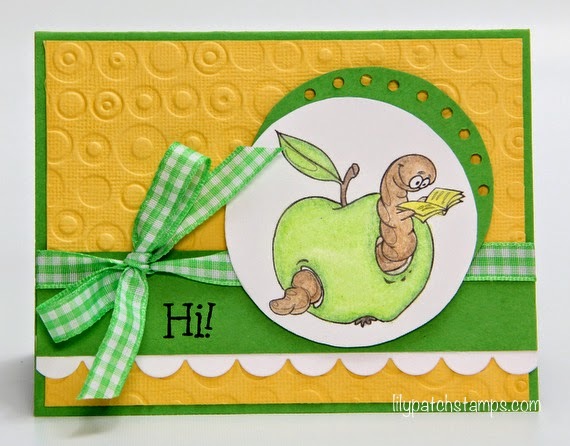 The green apple colored ribbon /bow is another wonderful accent- beautifully done!